Five months into his mandate, Justice Department special counsel Robert Mueller revealed his first charges yesterday. Donald Trump's former campaign chairman Paul Manafort was indicted along with his longtime business partner. And former foreign policy adviser George Papadopoulos made a guilty plea. We have still not heard from Mueller himself, so it's not yet clear where the investigation goes next. Let's bring in NPR justice correspondent Carrie Johnson. Hey there, Carrie. GREENE: So you've been reading these court papers. Are you seeing any clues about what happens now? JOHNSON: There are some clues. One, I think, involves the Foreign Agents Registration Act. Now, Paul Manafort, the former campaign chairman and his deputy, Rick Gates, were charged with failing to register as agents of a foreign government and making false statements about that. The grand jury indictment accuses them of working on behalf of Ukraine but telling the Justice Department that they weren't doing that. Now, these charges are controversial because the FARA law is rarely enforced. And in fact, Kevin Downing, a lawyer for Manafort, said it was only used six times since 1966 with one conviction. GREENE: One conviction in - what is it? - like, 50 years? JOHNSON: In 50 years, yeah. So this is a bit novel and unusual. But the reaction from some people on Capitol Hill has been surprising. Republican Charles Grassley from Iowa, the chairman of the judiciary committee in the Senate, has said it's really good to see the Justice Department enforcing the law and that it's a dirty little secret that a lot of people have not been registering as foreign agents, both Democrats and Republicans, for some time. Now, Grassley has done some oversight work on this, and he pointed out that two companies were working with Manafort and Gates. In fact, just yesterday Tony Podesta, a top Democratic lobbyist, announced he was leaving his company in the shadow of this investigation. And, you know, at least one other adviser with ties to the Trump campaign, retired General Mike Flynn, has belatedly filed a disclosure this year under the Foreign Agent Registration Act. So stay tuned on that. GREENE: OK. So these questions about registering as a foreign agent - that's one thing. But we have Manafort, the former campaign chairman - I mean, he's pleading not guilty to these charges. But he's certainly facing a lot of pressure. Could he somehow turn into a government witness that might lead this investigation elsewhere? JOHNSON: Paul Manafort has steadfastly denied wrongdoing. People close to him have told me he doesn't believe he has anything to give up on President Trump or anybody in the White House. That said, the pressure on him has been intense ever since that July surprise FBI raid of his residence in Virginia while he was sound asleep. And it's only getting worse. The indictment unsealed yesterday suggests the feds are not finished squeezing Paul Manafort. The authorities want to seize some real estate he owns in New York and Virginia at a time when he's already strapped for cash. And the indictment against against Manafort doesn't refer to contacts between him and Russians with close ties to Vladimir Putin, even though a lot of media reports suggest he emailed with a longtime Ukrainian client in Putin's inner circle to offer private briefings on the election. So Mueller may know more than he put in that indictment yesterday. There may be room to add charges against Manafort moving forward. GREENE: OK. But up until this point - I mean, yesterday the White House is still calling this investigation a witch hunt. And the White House press secretary, Sarah Huckabee Sanders, says there is no collusion. But we have this once-foreign policy adviser George Papadopoulos, his guilty plea - that whole situation seems to be raising questions about possible collusion and moving in that direction. Does it not? JOHNSON: I think it opens a new door. I think it opens a new door for the work of the special counsel and the people involved on these issues in the Trump campaign. Now, Papadopoulos hasn't told us all he knows, but the investigators have revealed in court papers that he's been talking to them since he was secretly arrested at Dulles airport in July. And he's been meeting with them and telling them things. His defense lawyers say they are not commenting on his behalf for now. But they say at some point in the future, they are going to want to talk about George Papadopoulos's involvement. They look forward to telling all the details of his story at that time. And he may be offering evidence against others still under investigation. We just don't know exactly what he's saying, in part because prosecutors wanted to keep his guilty plea secret for some time because they called him a proactive cooperator and they suggested that to let other people under investigation or other people of interest know that he was working with the Mueller team might chill their ability to interview witnesses and subjects of this investigation since July - from July to October, when the guilty plea was unsealed. 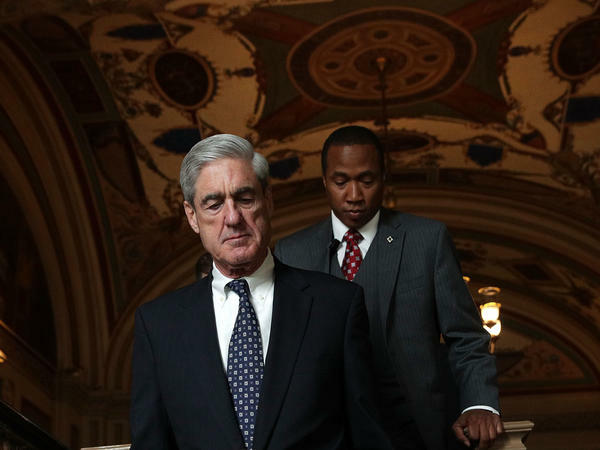 GREENE: Well - and I got to ask you about Robert Mueller's future. I mean, there are some Republicans now who are calling for him to resign in the wake of these charges. JOHNSON: Yeah. In fact, there's been a bill introduced in Congress - or at least some measure introduced in Congress that would starve Mueller's team of the funds it needs to continue this investigation. But for now, press secretary Sarah Huckabee Sanders says there's no intention or plan to make any changes with respect to special counsel Mueller. And a Trump lawyer told CNN that Trump has not talked about pardoning anybody involved in this investigation. That said, the pressure's on the White House now. And we'll have to watch closely to see what happens next. GREENE: Watch closely because a lot of developments could come - we'll see where this goes. NPR justice correspondent Carrie Johnson - Carrie, thanks.